Cityscapes :: An urban magazine from the global south :: New issue #3: The Smart City? How to think cities anew? When what we are seeing are not new londons, parises, new-yorks or even tokyos growing, we need to start re-thinking what urbanization and urbanism is about. New Cityscapes issue #3 out. Speaking from the south on ‘Smart Cities’. This is when we need a magazine like Cityscapes. Started in 2011 by artist-desginer-urbanist Tau Tavengwa and Sean O’Toole, backed up by southern urbanist stalwart Edgar Pieterese, the magazine gives a provocative shot or sip of a matured postcolonial critique of knowledge production. Indeed when urban Theory, capital T, is not longer valid for the type of cities we see in Rio de Janeiro, Lagos, Johannesburg, Mumbai, and Jakarta, we need new tools, registers and ways of engaging that allows for new theories of the urban to grow and influence city-making, including planning and design professions. This is when we need to ask, like Indian historian Dipesh Chakrabarty of how to “provincialize Europe”—re-inserting the ‘localness’ of European thought to allow for experiences of urbanization and scholarship from different regions to take hold and influence theory-making. If Europe and USA is merely a province in the world of knowledge-making, then how have other regions thought and enacted their cities? The Cityscapes magazine makes the amazing balancing act of being popular and punchy, while delivering a relentless critique that cities should not only be thought about from a EuroAmerican experience. But from locations like Lima, Nairobi, Mogadishu, Bangalore, Jakarta, Harare, and Medellín. This builds upon decades of academic critique of how theory—or established ways of thinking—has been critiqued. Indian urban scholar Ananya Roy (2009) and South African cultural geographer and comparative urbanist Jennifer Robinson (2002, 2005 etc.) have in a series of articles argued for a comparative urbanism, a cosmopolitan urbanism that can de-centre EuroAmerican theory and experience. Cityscapes #2 – the previous issue. In response to the ‘world city’ theory created by Saskia Sassen and in part Manuell Castells—which traces the economic relations for global capitalism and has come to create hierarchies of cities based upon the number of transnational companies that chooses to place their offices there—Robinson argues for theories of the ‘ordinary city’. This is not to say that the world city theory is not helpful to understand the internationalization of capitalism, and how it necessarily needs cities, but to say that its focus comes with effects. These ‘ordinary cities’ does not only ‘fall off the map’ of the ‘world city theory’, making these cities uninterested locations for research and policy, but these cities also suffer in the way that investment—private and above all public—are spent increasingly in cities that aspire to become ‘world class cities’. Rather than spending money on improving essential infrastructure to deliver safe water, sewage, electricity and food, money are spent on business parks, luxurious water front developments, and big event buildings (think the World Cup soccer stadium built in Cape Town, now standing mostly empty; or the Formula 1 racing track in the Omerli Watershed outside Istanbul, used once a year). Consequently, backed by the world city theory, a whole industry of consultants and thinkers have carved out a policy field to influence how decision-makers can turn their own cities into ‘world cities’. This shapes the urban agenda away from the problems and possibilities of the ‘ordinary city’ and in particular the needs of the urban poor. 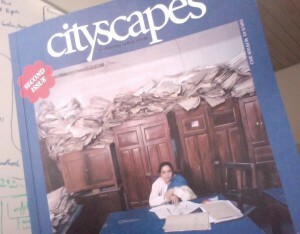 In Cityscapes last issue #2 the world city theory is under scrutiny. Through interviews and photography, the magazine unpacks infrastructural investment in Johannesburg, and also visits Bangalore. Increasingly many Indian cities are aspiring to become world-class. “As an instance of homegrown neoliberalism, the Indian world-class city is inevitably a normative project”, writes Ananya Roy in Worldling Cities edited book (2011). As reported, “Why? And for whose benefit is the world-class city?”. This fuzzily defined term speaks to the increasing use of networked information and communications technologies in ordering of large-scale urban phenomenon. The magazine visits Rio de Janeiro to find out what this means practically. “Technology gives you a faster response,” explains Dario Bizzo Marques, a technology systems coordinator at Rio’s $14-million integrated city management centre, home to Latin America’s largest surveillance screen. “We increasingly share the space and time of cities with semi-autonomous agents of a nonhuman, indeed non-biological, nature, from drones to algorithms,” offers Adam Greenfield in his provocative 100-point manifesto appearing in Cityscapes and addressing the pervasive use of tech-savvy urban management solutions. Noted urban theorist Ash Amin, in a cornerstone 5000-word interview with Matthew Gandy, is also wary of the ideological implications of reducing city management to the top-down marshalling of abstract data. If you are intrigued and need a stylish, punchy, provocative shot of postcolonial critique, make sure to get a copy of the new Cityscapes #3. It will hopefully come to destabilize how you think about cities. You can find more information here. If you are interested in the academic debates, I have just with Mary Lawhon and James Duminy submitted a paper to the International Journal of Urban and Regional Research (IJURR) with the title “Conceptual vectors of African urbanism: ‘engaged theory-making’ and ‘platforms of engagement’. The manuscript summarizes debates but also pushes towards clarifying some of the contribution from the recent research on urbanism in Africa and what it could bring to theoretical conversations about cities. I could send you a copy if you are interested. For other entry points, see papers by Chakrabarty, Roy, Robinson, Simone and Pieterse below. PS. The Cityscapes issue #3 will be launched Mar 27, 2013 at The Book Lounge, 71 Roeland Street, Cnr Buitenkant & Roeland Street, Cape Town. More information here. Chakrabarty, D. (2007). Provincialising Europe: Postcolonial Thought and Historical Difference (Second.). Princeton and Oxford: Princeton University Press. Parnell, S., & Robinson, J. (n.d.). (Re)Theorizing Cities from the Global South: Looking Beyond Neoliberalism. Urban Geography. Pieterse, E. (2008). City Futures: Confronting the Crisis of Urban Development. Global Issues Series. London: Zed Books. Roy, A., & Ong, A. (2011). Worlding Cities: Asian Experiments and the Art of Being Global, 41. Simone, A. (2011). City Life from Jakarta to Dakar: Movements at the Crossroads. London: Routledge. Cool video about how a movement for social-ecological transformation took advantage of a window of opportunity. Dutch cyclist organizations pushing for new cycling infrastructure in the Netherlands. Read more on the Bicycling Dutch website in this post. An interesting post compares public space in locations in Netherlands in 2012 and 1957. The system has lost its self-evidence, its automatic legitimacy. And now the field is open. This is a very important achievement. He contends, for instance, that what we might be experiencing, is a time when Western-led capitalism, which for a century has been able to combine exploitation with liberal democracy, is overtaken – or shown less effective – than a form of capitalism with, what he refers to has “Asian values”, a Chinese-Singaporean authoritarian capitalism. The liberalist argument, that capitalism will always sow the seeds of democracy, under which we can all live reasonably well, as it did for instance in Spain (after Franco), in Chile (after Pinochet), and in many other countries in the world, might not longer hold true, Zizek means. It could be that the kind of capitalist model that is forged through China, outcompetes a western-liberal mode of capitalism. Zizek also laments the tragedy of Europe, which seems like a true tragedy, if the only alternatives Europe can construct for themselves is either a “Brussel bureaucratic model” that gives more of the same, or a nationalist anti-immigrant stance on the rise in European countries. ‘Town’ series on BBC2 examines the role of towns in the UK. The last show in the series looks at the resilience of Totnes, the founding site of rapidly growing Transition Towns movement, which is represented locally by Transition Town Totnes. The show focuses on the town, rather than the transition movement, but its focus on the resilience and deep history of Totnes is quite interesting. I especially found interesting how the town is connected to the utopian experiments of the nearby Dartington Hall, which is now home to the sustainability focused Schumacher College. The entire show is available on youtube. A Saxon river town in South Devon, Totnes is one of the UK’s oldest towns. It has seen tough times through its long history, but adversity has taught it to innovate. Geographer and adventurer Nicholas Crane visits the home of one of the greatest social experiments of the 20th century, and uncovers the test bed for an ambitious new idea that aims to change our urban life forever. Junot Diaz, author of the fantastic novel The Brief Wondrous Life of Oscar Wao, writes about Haiti’s earthquake in Apocalypse: What Disasters Reveal. The experience of Port au Prince was quite difference from Lyttleton, New Zealand response to their own earthquake. So the earthquake that devastated Haiti: what did it reveal? Well I think it’s safe to say that first and foremost it revealed Haiti. This might strike some of you as jejune but considering the colossal denial energies (the veil) that keep most third-world countries (and their problems) out of global sightlines, this is no mean feat. For most people Haiti has never been more than a blip on a map, a faint disturbance in the force so far removed that what happened there might as well have been happening on another planet. The earthquake for a while changed that, tore the veil from before planet’s eyes and put before us what we all saw firsthand or on the TV: a Haiti desperate beyond imagining. Yes, I have hope. We humans are a fractious lot, flawed and often diabolical. But, for all our deficiencies, we are still capable of great deeds. Consider the legendary, divinely inspired endurance of the Haitian people. Consider how they have managed to survive everything the world has thrown at them—from slavery to Sarah Palin, who visited last December. Consider the Haitian people’s superhuman solidarity in the weeks after the quake. Consider the outpouring of support from Haitians across the planet. Consider the impossible sacrifices the Haitian community has made and continues to make to care for those who were shattered on January 12, 2010. Consider also my people, the Dominicans. In the modern period, few Caribbean populations have been more hostile to Haitians. We are of course neighbors, but what neighbors! In 1937 the dictator Rafael Trujillo launched a genocidal campaign against Haitians and Haitian Dominicans. Tens of thousands were massacred; tens of thousands more were wounded and driven into Haiti, and in the aftermath of that genocide the relationship between the two countries has never thawed. Contemporary Dominican society in many respects strikes me as profoundly anti-Haitian, and Haitian immigrants to my country experience widespread discrimination, abysmal labor conditions, constant harassment, mob violence, and summary deportation without due process. No one, and I mean no one, expected anything from Dominicans after the quake; yet look at what happened: Dominican rescue workers were the first to enter Haiti. They arrived within hours of the quake, and in the crucial first days of the crisis, while the international community was getting its act together, Dominicans shifted into Haiti vital resources that were the difference between life and death for thousands of victims. In a shocking reversal of decades of toxic enmity, it seemed as if the entire Dominican society mobilized for the relief effort. Dominican hospitals were emptied to receive the wounded, and all elective surgeries were canceled for months. (Imagine if the United States canceled all elective surgeries for a single month in order to help Haiti, what a different that would have made.) Schools across the political and economic spectrums organized relief drives, and individual citizens delivered caravans of essential materials and personnel in their own vehicles, even as international organizations were claiming that the roads to Port-au-Prince were impassable. The Dominican government transported generators and mobile kitchens and established a field hospital. The Dominican Red Cross was up and running long before anyone else. Dominican communities in New York City, Boston, Providence, and Miami sent supplies and money. This historic shift must have Trujillo rolling in his grave. Sonia Marmolejos, a humble Dominican woman, left her own infant babies at home in order to breastfeed more than twenty Haitian babies whose mothers had either been seriously injured or killed in the earthquake. Consider Sonia Marmolejos and understand why, despite everything, I still have hope. After all, apocalypses like the Haitian earthquake are not only catastrophes; they are also opportunities: chances for us to see ourselves, to take responsibility for what we see, to change. One day somewhere in the world something terrible will happen, and for once we won’t look away. We will reject what Jane Anna and Lewis R. Gordon have described in Of Divine Warning as that strange moment following a catastrophe where “in our aversion to addressing disasters as signs” we refuse “to interpret and take responsibility for the kinds of collective responses that may be needed to alleviate human misery.” One day somewhere in the world something terrible will happen and for once we will heed the ruins. We will begin collectively to take responsibility for the world we’re creating. Call me foolishly utopian, but I sincerely believe this will happen. I do. I just wonder how many millions of people will perish before it does. Many cities are investing in bicycle infrastructure such as expanded bike lanes or subsidized bicycle sharing programs, and this is increasing bicycle traffic. InfraNet Lab blog writes that in Montreal and New York City ridership has increase about 30% since 2008. London has more than doubled since 2000. London’s new large capacity bike lanes have lead to a 70% increase in cycle traffic into the city reports UK’s Bikehub in one year. 1) James Schwartz argues that it is good for urban businesses. Invite a motorist for a bike ride through your city and you’ll be cycling with an urbanist by the end of the day. Even the most eloquent of lectures about livable cities and sustainable design can’t compete with the experience from atop a bicycle saddle. “These cars are going way too fast,” they may mutter beneath their breath. Suddenly livability isn’t an abstract concept, it’s an experience. Human scale, connectivity, land use efficiency, urban fabric, complete streets… all the codewords, catchphrases, and academic jargon can be tossed out the window because now they are one synthesized moment of appreciation. Bicycles matter because they are a catalyst of understanding – become hooked on the thrill of cycling, and everything else follows. Now a new freeway isn’t a convenience but an impediment. Mixed-use development isn’t a threat to privacy but an opportunity for community. And maybe, just maybe, car-free living will eventually be seen not as restrictive, but as a door to newfound freedom. The real reason why bicycles are the key to better cities? Some might call it enlightenment. And BBC reports on research that suggests that cyclists are happier people. Hopefully the indirect consequences of this regrowth of urban cycling will be positive. I know I’ll be looking at the city differently on my bike to work. As a first step, the city wanted to model how global warming might play out locally. … the scientists said, Chicago would have summers like the Deep South, with as many as 72 days over 90 degrees before the end of the century. For most of the 20th century, the city averaged fewer than 15. By 2070, Chicago could expect 35 percent more precipitation in winter and spring, but 20 percent less in summer and fall. By then, the conditions would have changed enough to make the area’s plant hardiness zone akin to Birmingham, Ala. But what would that mean in real-life consequences? A private risk assessment firm was hired, and the resulting report read like an urban disaster film minus Godzilla. The city could see heat-related deaths reaching 1,200 a year. The increasing occurrences of freezes and thaws (the root of potholes) would cause billions of dollars’ worth of deterioration to building facades, bridges and roads. Termites, never previously able to withstand Chicago’s winters, would start gorging on wooden frames. Armed with the forecasts, the city prioritized which adaptations would save the most money and would be the most feasible in the light of tight budgets and public skepticism. … Much of Chicago’s adaptation work is about transforming paved spaces. “Cities are hard spaces that trap water and heat,” said Janet L. Attarian, a director of streetscapes at the city’s Department of Transportation. “Alleys and streets account for 25 percent of groundcover, and closer to 40 percent when parking lots are included.” The city’s 13,000 concrete alleyways were originally built without drainage and are a nightmare every time it rains. Storm water pours off the hard surfaces and routinely floods basements and renders low-lying roads and underpasses unusable. To make matters worse, many of the pipes that handle storm overflow also handle raw sewage. After a very heavy rain, if overflow pipes become congested, sewage backs up into basements or is released with the rainwater into the Chicago River — … As the region warms, Chicago is expecting more frequent and extreme storms. In the last three years, the city has had two intense storms classified as 100-year events. So the work planned for a six-point intersection on the South Side with flooding and other issues is a prototype. The sidewalk in front of the high school on Cermak Road has been widened to include planting areas that are lower than the street surface. This not only encourages more pedestrian traffic, but also provides shade and landscaping. These will be filled with drought-resistant plants like butterfly weed and spartina grasses that sponge up excess water and help filter pollutants like de-icing salts. In some places, unabsorbed water will seep into storage tanks beneath the streets so it can be used later for watering plants or in new decorative fountains in front of the high school. The bike lanes and parking spaces being added along the street are covered with permeable pavers, a weave of pavement that allows 80 percent of rainwater to filter through it to the ground below. Already 150 alleyways have been remade in this way. … Awareness of climate change has filled Chicago city planners with deep concern for the trees. Not only are they beautiful, said Ms. Malec-McKenna, herself trained as a horticulturalist, but their shade also provides immediate relief to urban heat islands. Trees improve air quality by absorbing carbon dioxide, and their leaves can keep 20 percent of an average rain from hitting the pavement. Chicago spends over $10 million a year planting roughly 2,200 trees. From 1991 to 2008, the city added so many that officials estimate tree cover increased to 17.6 percent from 11 percent. The goal is to exceed 23 percent this decade. On Dot Earth Andrew Revkin follows up with links to his description of Seoul and other cities that have substantially improved their ecological infrastructure. A few recent papers on resilience are quite exciting. Below are brief pointers to them. Hopefully we will have more time to right about them in the future. Uses experimental lakes to show that early warning signs of regime shifts can be detected (with high frequency monitoring). Response of a community in Honduras to Hurricane Mitch shows that disasters can provide opportunities for the poor. A geographer reflects on the consequences of resilience approaches to cities – especially Urban LTER in USA. An ecosystem ecologist looks at the history, problems, and possible future of the ecosystem concept. The near simultaneous floods in Brazil and Brisbane provide a contrast in terms of their impact (and media coverage). Brisbane is experiencing huge property damage, but relatively little loss of life – while Brazil is experiencing large loss of life, without as much property damage. Less than a year ago, just a few miles from where this week’s devastation occurred, 160 people died when houses built on top a hillside garbage dump gave way. Another 250 were killed by mudslides in other parts of the state. In São Paulo, the two rivers that ring the city routinely burst their banks causing traffic chaos and some neighborhoods spent several weeks under water last year. Part of all this is just Queensland. It comes with the territory, as they say. Comes with the terrain might be a better way of putting it, as Brisbane is basically built in a flood plain. You can’t help but consider the folly of building Australia’s third largest city in a flood plain, but then Melbourne is built on a big old swamp too, so that’s two of them. And Sydney will hardly be immune to rising sea levels.Brisbane is characterised, like perhaps no other city on earth, by a particular kind of domestic architecture: the Queenslander. This is typically a wooden house with a pitched tin roof overhanging a wrap-around veranda, a cruciform internal layout to enable air flow, and elevated high on stilts to catch the breeze and avoid the bugs. Designed to create good air flows under and through the building, and originally enable people to sleep outside, you see them everywhere across the city. It’s uniquely identified with the city. Over time, they’ve become both coveted and replaced, with good examples being preserved and becoming expensive, and yet many demolished in favour of new builds done in the cheaper ‘slab on ground’ model of building, which is the easiest way of doing it. But guess which is most appropriate for these conditions? Those wooden houses on stilts are often sitting pretty above the rising water at the moment. There will be much finger-pointing after this, from insurance companies refusing to pay up due to the releases from dams not technically being floods (what on earth else are they then? ); from those who point out that, as memory of the ’74 floods faded, developers were allowed to build in flood plains earmarked for further dams; from those pointing out that the floods are a result of climate change (even if these ones aren’t, future ones will be); from those pointing out that the entire fragile mode of suburban development of Australian cities is particularly unsuited to the resilience required of the near-future; that development should not have been allowed on the riversides and basins of floodplains, and so on. There will be a time for discussing how to achieve more resilient patterns of settlement in Australia. I’m not at all convinced that Australians have the appetite for genuinely addressing this, even despite the floods. Most people are apparently incapable of thinking about the future on the scale required for investment in things like urban resilience, even accepting we need to get better at communicating all this. I’m not sure people see the connection between devastating flooding and a culture where property developers call the shots, where cost drives aspiration in building and infrastructure, and where a car-based fabric of dispersed tarmac’ed low-density communities is virtually the Australian dream. But if it’s not events like this, I’m not sure what else it would take to make this clear and force the issue.